Cappadocia is not a town, rather a large region somewhere in the middle of Turkey. The region is volcanic, though the last eruption was 5 million years ago. The many eruptions over time deposited layers of ash on the ground, which built up to become mountains. Over time the wind and rain has eroded these layered mountain of ash to create some amazing and interesting rock formations. 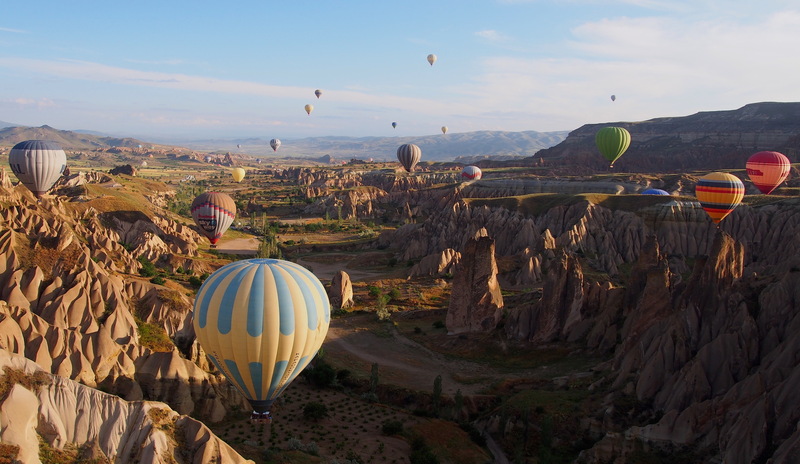 The one absolute must-do thing in Cappadocia is to go hot air ballooning over the valleys. It is phenomenal! There are two flight times each day. The first time is for sunrise (hotel pickup is at about 4am) and approximately 100 balloons are allowed to fly. The second flight of the day is still ridiculously early, hotel pickup around 5am, and approximately 85 balloons are allowed to fly. 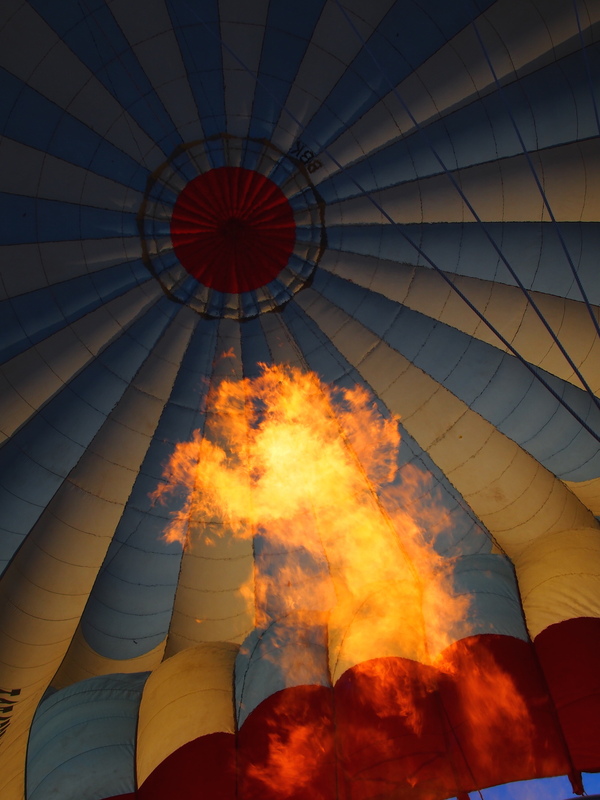 We had the second flight of the morning, the air was crisp but clear, and the view of all the balloons in the air as we waited for our balloon to be filled with air, was just breath taking. Our pilot Gülsah was one of only five female pilots of over 100 in the region, she took us low into the valleys as well as up to 6000 feet. She navigated us safely around mountains and avoided other balloons. It was so calming to be in the balloon, floating with the wind and taking in some of the most amazing views you could imagine. It’s another of those activities that is just so fantastic it is hard to put into words. Throughout the region you can find many valleys, mountains, caves and fairy chimneys. 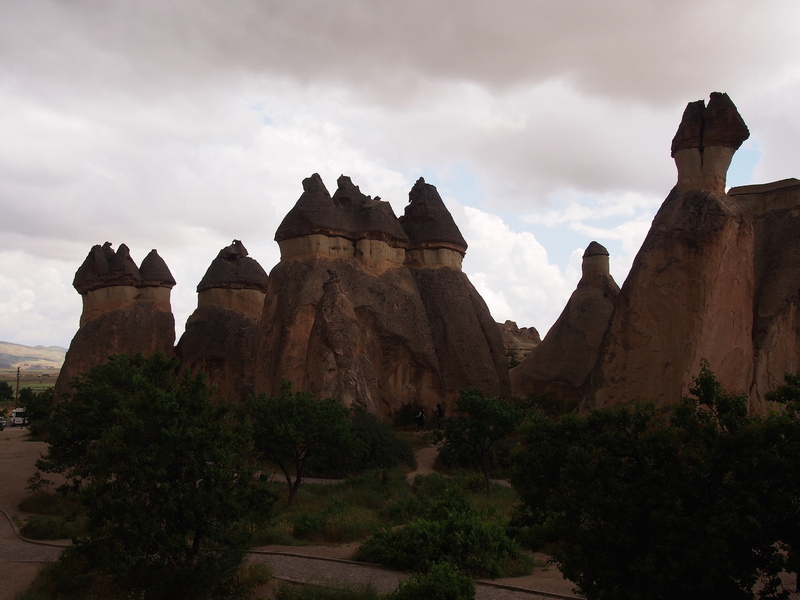 Fairy chimneys are mostly found around the town of Göreme. They are typically tall thin rock formations that appear to have a hat on them, kind of mushroom like. In some places the chimneys aren’t singly single formations, but clustered. They say that it was unknown how the chimneys got their ‘hats’ and that it must have been fairy’s that made them, which is how they got the name Fairy Chimneys. The appearance of the hats or mushroom tops of the chimneys is more likely caused by wind erosion. The wind must blow tear through the valleys but only go up to a certain height, which I find odd and a little hard to believe, but it’s otherwise a little hard to imagine hot the chimneys got their tops. No matter what the cause, the fairy chimneys look very cool. 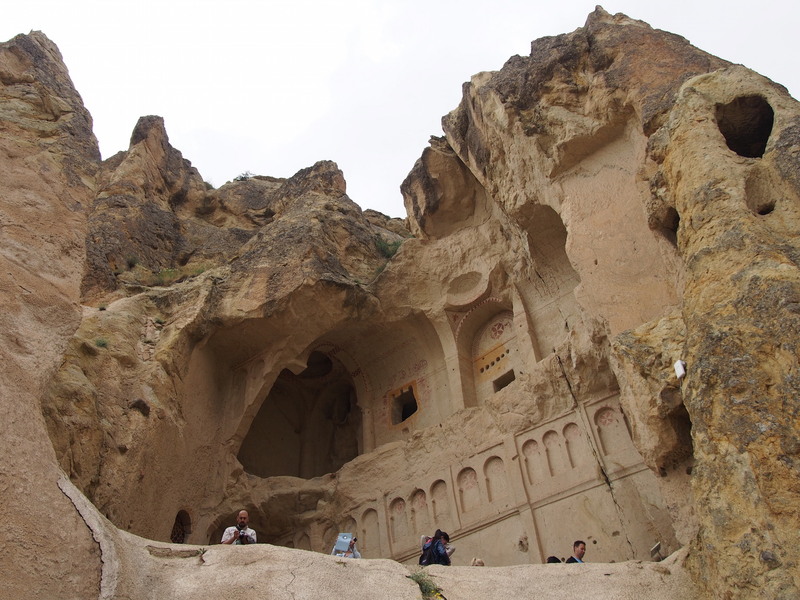 In Göreme is also an open air museum which shows many of the cave dwellings and churches. It’s a great spot to visit as you get to look at the constructions of the cave dwellings at close quarters. Get a feel for how they lived and you can even see a lot of original art works. 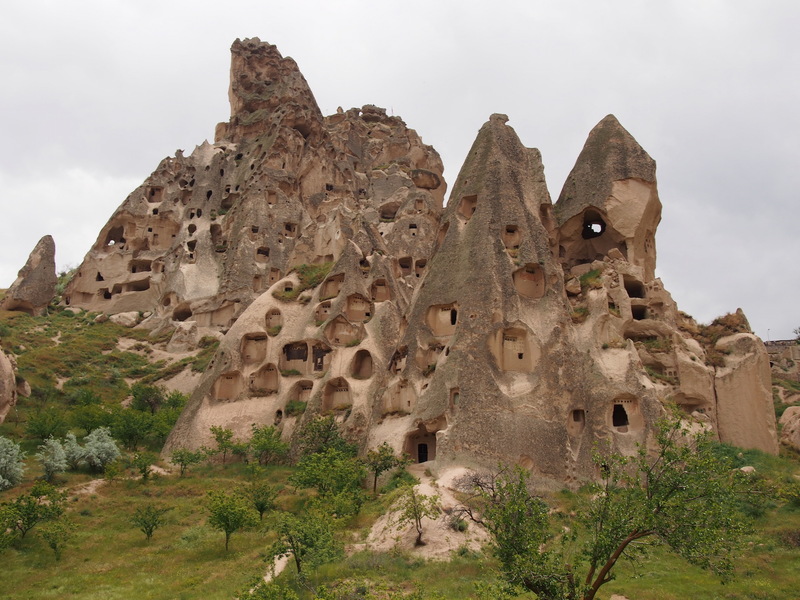 While the rock formations in Cappadocia are all natural, their conversion to caves is absolutely the result of humans. Some cave dwellings are still privately owned, if they aren’t in a national park people may even still live in them. 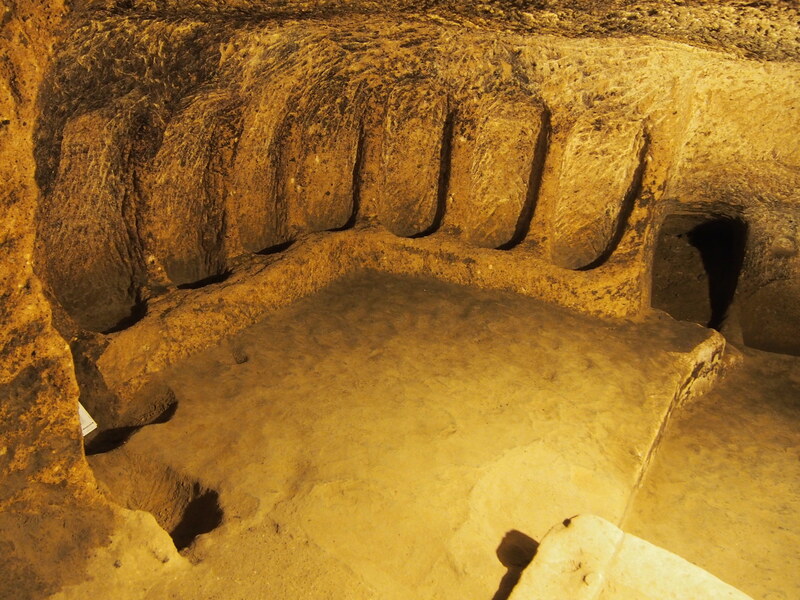 Back in the time of the Hittites, underground cities were created as places to hide from the enemies. Seeking refuge in an underground city was always a temporary option, but in some cases people lived in the cities for up to a year. The cities have many levels and an endless stream of tunnels. 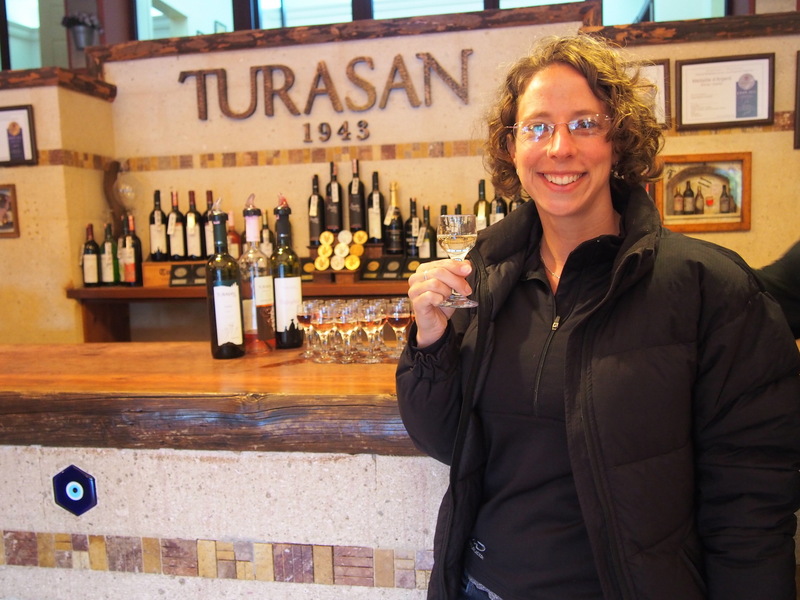 I was incredibly impressed to find a winery in one of the cities!! We interrupted all our visits to rock formations with an evening show. We went to see the Whirling Dervishes. 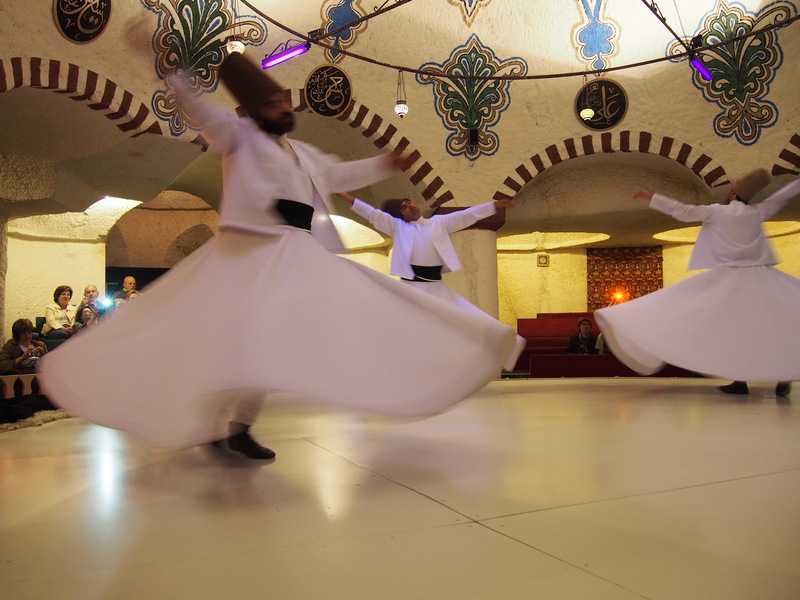 The Sufis whirl around in circles as a form of meditation, in which they feel a connection between their god and the earth. as they spin they reach their arms up, the right hand higher than the left and their head tilted to the right. The right hand is their connection to god and their left is their connection to earth. The whirling ceremony is led by a Sheikh and is made up of seven parts, including singing, bowing to each other, four sets of twirling and a reading from the Qu’ran. I found it quite an interesting ceremony to watch. If you come to Turkey, make sure you see a ceremony. During our time in Cappadocia the weather was a bit up and down, we had some moments of brilliant sunshine and other moments of thunder and hail storms. We still got to see a great deal of the area, including visits to Uchisar Castle, the Rose Valley, Pigeon Valley and the Red Valley. At one point on a rainy afternoon, we also managed to fit in a wine tasting of some local wines. An absolute bonus and high point of our visit to Cappadocia was staying in a cave hotel (MDC Hotel) which was just amazing! 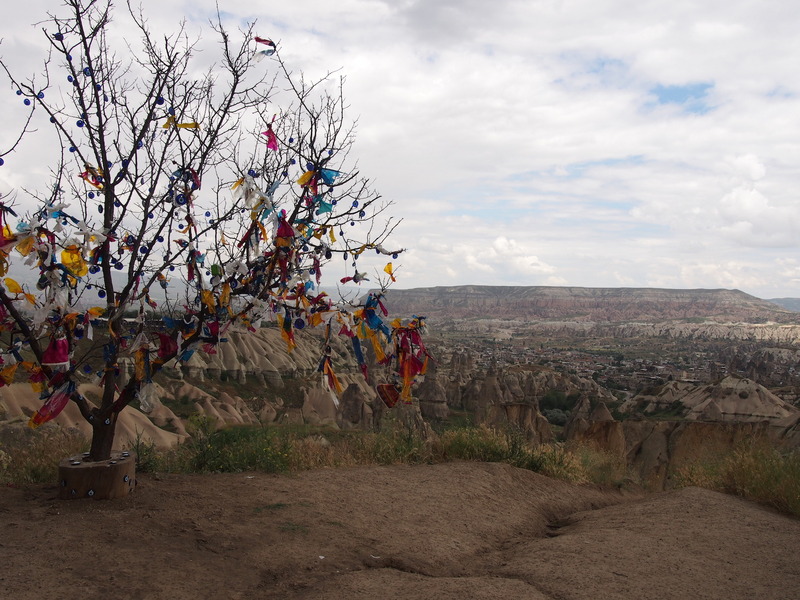 Everywhere you look in Cappadocia there are amazing things to see. Anyone considering a trip to Turkey must make time to visit! 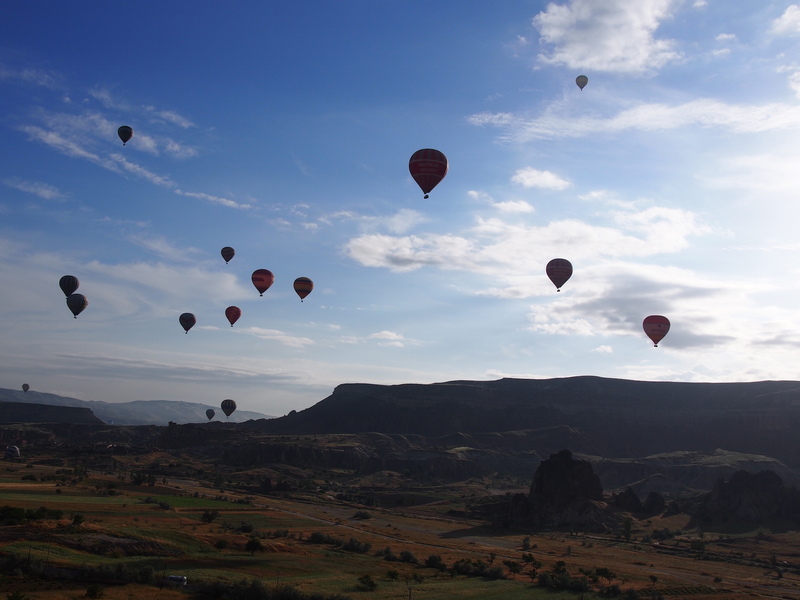 For all my Cappadocia photos, check out the album on Flickr.